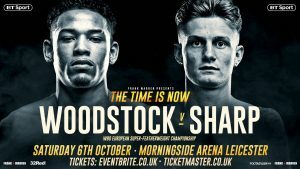 Sharp (13-0) had the opportunity to do some homework on Woodstock (11-0) when he witnessed the fight in which Lyon beat Craig Poxton to claim the WBO European title; the belt he will be defending when they step into the ring on October 6th. “It was a good fight.” admitted Sharp. “Lyon is going to come out at the first bell and try and put the pressure on me and try and sit on my chest for the ten rounds. “I’ll be too clever for that and my boxing abilities are too cute for that to happen. Along with having the ‘challenger’ status, Sharp will be in Woodstock territory on fight night when he travels up from London to fight in Woodstock’s native Leicester. However, it is a factor undaunting to Sharp who believes it could feel quite the opposite when making the journey up the M1 from London and into the Midlands. “It might be in his back garden but at the end of the day it will just be me and him in that ring.